I just came from a waxing salon yesterday and every single time I visit, I wish those nasty hairs won’t have to grow back ever again. Talk about wishes coming true. 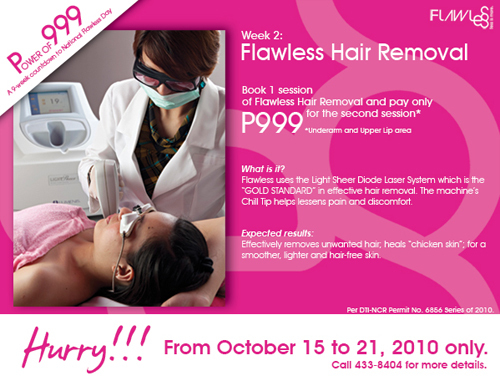 Week 2 of Flawless Power of 999 is Laser Hair Removal. Book 1 session and pay only for the second session. This promo is from October 15 to 21, 2010 only. Laser Hair Removal is a Laser treatment to remove hair follicles and leave the skin smooth and hair-free. The Laser Treatment system uses a unique cooling handpiece, it minimizes skin irritation that other methods may create. Since it is non-invasive (no needles to penetrate the skin), the risk of introducing bacteria into the skin is reduced. Typically 60 to 95% of the hair can be reduced permanently. There is nothing available that will prevent new hair from growing in the future. This treatment needs diagnosis, preparation and care before the procedure. Skin peel is one of the services that best complement underarm hair removal. Dark armpits is a result of irritation when using other modalities to remove hair. eg.plucking, shaving. Laser hair removal will not cause dark underarms.